A few people have asked for this so thought I'd add it. If you want to include the loop it's a pretty simple affair. Volume 2 goes to the tip of a switched socket (Send), and the normally closed contact from the tip goes to the main stomp switch board output lug, and also the tip of a second normal mono socket (Return). So when no cable is in the Send socket the signal is being passed directly to the main bypass stomp switch. When a cable is inserted into the Send socket, the contact is broken and so all the signal passes through the Send, back through a return cable to the main stomp. A 510K resistor is also soldered between the tip and shield of the Return socket to act as a pulldown resistor for the output of whatever is in the loop. I think if I was going to build this I'd probably add a third stomp and have the loop switchable on the fly to make it a little more versatile. Then you wouldn't have to bother with a switched socket and could use conventional true bypass wiring of the additional stomp to bring the loop in and out of circuit. Hey Mark when you say about the loop I am just a little confused, When you say a switched socket , do you mean like a Stereo Jack? Like the one we use to run a battery? So volume 2 goes to the tip of send, but I am not certain what you mean by "the Normally Closed Contact" Is that the third Lug of the Stereo Jack?? Thank you for doing this layout! Great sounding pedal. Thanks for that layout! I've made it with both the 4558 and 4559, and have an original too, and to my ears the differences are subtle so I'd be more than happy to use either. Good stuff, I have a dozen 4558s coming. That'll work out grand then. Thanks Mark! The cap on pin2 reads 100p. Correct? soo.... i was thinking yeh man itd be cool to put the loop on a stomp switch. But then I read the wiring- it is just placed right after the output of the volume control??? so really, putting an effect right after the Tim in your chain would be the same as putting it into the loop, right? and now i'm looking at the boost circuit... or lack thereof, can you explain the boost circuit? is it just like switching to a louder setting on the volume pot? and the tone a variation of the bass pot? Hi, juste finished the building. I can hear the the guitar through the effect but it's a very low volume. Every pots working but the output level is very low! Both 10n cap are 630v, is this problem ? The voltage rating of the caps won't make a difference. Does it sound good, but just at a low level? If so it strongly suggests you could have a cold solder joint somewhere. I did again my joint, and it's finally working ! sounds incredible ! Excellent stuff, and thanks for verifying Georges! 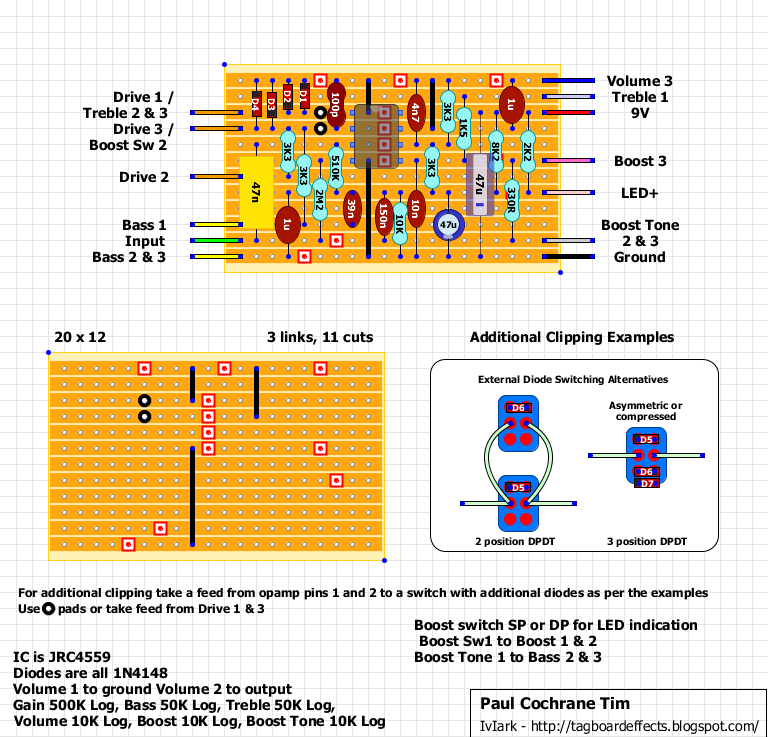 a little confused on the boost switch wiring. was going to use a regular 3pdt since i have a bunch on hand and add the LED. can you clarify how to do this? IvIark, how noticeable should the boost be? The overdrive sounds amazing but when I engage the boost I can't notice a difference. Finished this this morning. (without effects loop). The boost pot is in reverse, but built it with all pots on the face so the wiring maybe correct as the original has the boost controls to the back. As for the boost not being noticeable, when the Timmy is off and boost engaged there is no difference but when the Timmy is on it is very noticeable. The boost tone isn't very active though. Sounds brilliant but If I wanted a Tim I'd just build the 'normal' Timmy without the boost. Thanks mate, I've updated the layout. Just FYI - I use this (brand) pedal in my playing rig. The tone control are passive (cut only) so hardly worthwhile to me. The layout of this pedal may be the same as mine, but it is labeled completely different. In any case, the drive section sounds great but what really makes this pedal work is the combination of some boost with maybe just a little drive. (I use mine to push a tube pre-amp already in high gain, so it is mostly volume boost which also adds a little edge). In any case - if you use it mostly as a boost (for leads) when you engage it with the foot switch on the right (mine is not labeled bypass, it is called "On" so the LED lights when it is NOT bypassed. When I turn mine on, it gives me boost + the drive channel plus the loop. So, I have a delay pedal in this loop. In other words - if you use this just for leads, having the loop makes perfect sense because it turns ON the loop only when you turn on the effect - not quite the same is if you just followed this pedal with another effect - you only have to hit one button. Now - to be honest, I use this pedal in my loop of my Marshall or EVH5150iii - and it sounds great. If you need a way to get your leads over the mix, this is it - you get to add volume, drive, tone and an effect all with one footswitch. It has everything I need. In fact, I would really like to know how to add effects loops to other pedals, because when you only use them for lead boosts, for example, the added delay (or whatever) is exactly what the Dr. ordered. Sorry, I should have said "the bass & treble" controls are merely passive (cut only). The "tone" knob on the back adds a lot of fullness to the overdrive channel. I also only like the center position on the diode switch, the other options just don;t work for me, but that could be my guitar or whatever). The YouTube demo seems to be of the older model with "bypass" and no diode option switch. I highly recommend looking at a newer demo, since it appears this layout is for the newer model of Tim (the old one did not have a diode option switch as far as I know). HELP!!! My Tim clone is not doing what it's supposed to!! I built 2 Timmys and this is my first Tim, but I just can't figure out what's wrong. Symptoms: I use a Carl Martin Big John power supply but the pedal sounds like it is running on a flat battery (almost ZERO headroom and SUUUPER low quality sound) the output level is oky-ish. All knobs and switches do what they should. I tried changing the IC but it behaves EXACTLY the same. Just taking a wild guess, but the 100pf cap is silver mica. But what is the 47nf cap at the input? Or does it matter. Guessing Mallory 150 or CDE WMF. The caps shown in the layout were based around the dimensions of ones I had in stock that I intended to use for the build. I did use silver mica for the 100p, but you could use ceramic or ceramic multilayer and it will be just as good. Likewise the 47n that I used was a polypropylene Illinois MPW but you could use a Mallory if it's a good fit for the space, or any poly film cap you like and the end results will be great. But caps are (very) imperfect with a many differing characteristics that can vary based on temperature, voltage, frequency amongst other things, and contrary to what I always say on here about using pretty much any caps, I actually do think that there are very slight audible differences between "some" caps "sometimes". I have never thought one cap type had "more mids" or any similar claim that you hear sometimes, because any differences you hear in frequency response like that will be down to tolerance and so variation in value rather than the constituent material. But I do think in dirt effects you can sometimes hear subtle differences in the character of the distortion for instance. These are extremely subtle, never night and day and having conversations with people I trust completely I also know that a lot of people will notice no difference whatsoever. I will (and do) pay a premium for cool looking caps, but most of the time will be more likely to pay a premium simply because you get what you pay for and when you pay a bit extra you can get caps with tighter tolerances, that won't be affected by external influences like temperature changes, that will last longer and that may have physical size advantage like the dimensions of the higher value Panasonic ECQ-V caps compared to greenies. Hello, thanks a lot for this great blog!!! Please, tell us some examples. Are the input area,before opamp, the most sensitive to different components? Okay, looking at making this but can't understand the offboard given how I think a Tim has offboard done. I believe the Tim (at least some of them) have a push/pull on the "Boost" - I don't see that notated anywhere. From what I have read it controlled the compression on the whole signal (whether boost was engaged or not) - seems like that may just be the clipping switch if that is the case. Thoughts? What size box would be best here? I'm not planning on doing the loop, but it looks like PaulC had an extra tall box - I was thinking a 1590BB since I wanted to do the two footswitches but no loop. Just built.. Finally got it working.. Made a few dumb mistakes due to me being quite new at this.. Comparing it side by side with my Paul C Tim. Why does the original Tim have a lot more treble available then mine? With the treble the whole ways up its still filtering off highs, and the whole ways down the the pedal is very muffled. Any guess's? I am confused on the boost switch wiring. When you refer to Sw1 and Sw2, are you referring to solder lugs, or positions? A diagram would be super helpful. Those are lugs. If you are looking at a SPDT, the top is Sw1, mid Sw2, bottom S3. Is someone able to make a visual for the effectsloop. I am just not sure how to make it. And I do not see any gain pinout on the vero, but it does mention a 500k pot in the descriptions. Is the naming different than the original? The tim has Gain, Bass, Treble, Volume on top and Tone and Drive on the back. How does that compare to pots on the vero? Paul's "Gain" is referred to as "Drive" on the vero and is the 500k pot (which for some reason is labeled Gain in the notes). Paul's "Drive" is referred to as "Boost" and the "Tone" is referred to as "Boost Tone". I believe - I haven't built it, just guessing. I think there is a switch missing in the vero. 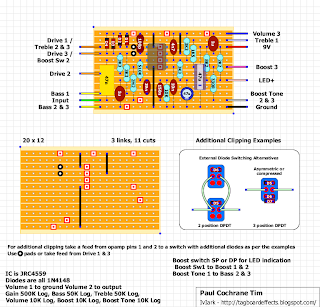 If you look at the photo's of the opened effect, you see that the soft clipping switch on the back of the boost drive pot is connected to the top of all the clipping diodes and lug 1 of the Gain pot. So there shoul be a switch between A1 (top left hole) on the vero and lug 1 of the gain/drive. That's what the "additional clipping options" does. The Tim had a few iterations (and this is DIY) so you have flexibility.